Ok, I’ve been tardy in posting. I’m very sorry about that, lot’s of things are going on. This post is, obviously, a bit delayed, but I think it’s important that people realize why this is amongst the dumbest ideas ever and will demonstrate how one can try to pull the wool over the eyes of the public. 1. Unlike residential mortgages, there are multiple metrics for value and credit worthiness of a commercial property. Residential properties can be looked at with a few paramters in mind, but there is a certain amount of behavioral science that undergirds mortgage models. For residential mortgages, one mainly considers FICO score and LTV (ratio of loan amount to value). However, these are not created equal: FICO is used to ascertain probability of default and LTV is used to figure out loss severity with a binary “under water or not” input into default probability as well. The intuition here is that how much one expects to lose is the probability you lose anything at all times the severity (percentage of loan value) of that loss. We can debate if the world is this simple (it isn’t, I’ll win that one), but that’s how one analyzes individual mortgages in the context of a pool. Note what is NOT in there, the actual rate of interest or income of the borrower (theoretically contributes to FICO, but FICO is largely a black box). Commercial mortgages, on the other hand, are sized to two parameters: LTV and DSCR. DSCR is the Debt Service Coverage Ratio and is net cash flow (NCF) from the property divided by the monthly interest payment, and has traditionally been constrained to 1.20x as the minimum acceptable ratio. Further, the cashflow is the result of a detailed underwriting process where every line item (most important being rent, obviously) is analyzed and researched to find the correct assumptions. Values, unlike residential properties which are dollars per square foot, are determined by capitalization rates or cap rates for commercial properties. The cap rate is the NCF divided by the value of the property. So, if a property that generates $10 million “trades” at a 10% cap rate (which is ridiculously high, bubble cap rates were around 4% and normal cap rates are around5-7% for regular properties), it would “trade” at $100 million (trades being used to denote the theoretic level it could be bought or sold). What we see here is that there are three elements of analyzing a loan here: the actual cashflow the property generates is scrutinized, the ability to service debt from that cash flow constrains the size of the loan, and the valuation of properties constrains the size of the loan along a different, but not unrelated, dimension. 2. The riskiest properties in the commercial mortgage market are structured as much shorter-term loans. If you are a developer and you aren’t refinancing a mortgage on a cashflowing property, you don’t get a 10-year fixed-rate loan. You get a two-year loan whose interest rate floats (although there is a cap purchased, so the property or developer has a maximum payment) and is extendable if you meet certain conditions and pay certain fees. These sorts of loans are made on newly-constructed complexes with no current cashflow, properties undergoing a severe renovation or being repositioned in such a way as to introduce a lot of uncertainty (adding floors, changing building type, etc. ), and other risky properties. Less risky properties get 10-year fixed rate loans, but they aren’t 10-year amortizing loans, they are 30-year amortizing loans that come due in 10 years. This is called a 10-year balloon payment. This means that in ten years the average commercial property will only have paid back 20% of their loan when the remaining 80% comes due. Clearly this is a regime meant to discourage unlevered ownership. 3. For very large loans, in addition to floating rate loans, commercial properties have low leverage mortgages and the additional debt comes in the form of mezzanine debt. Why is this important? Well, mezzanine debt, for those who aren’t familiar with the term, is debt against equity–the owner puts up his/her ownership stake as the collateral of the debt. So, if one fails to make a payment on the mezzanine debt, the mezzanine debt holder can take the property. Note, however, this is unlike a bank foreclosing on your house–the mortgage in this scenario is above the mezzanine debt and is undisturbed by the default of the mezzanine debt. The mortgage holder is still owed money, but from whom the checks are coming is irrelevant to the mortgage holder. This structure exists for a number of reasons, including tax and accounting reasons, but one reason it is to often used is that mezzanine debt makes it much easier to transfer the property’s ownership versus having one large mortgage. It shouldn’t surprise anyone, though, that this complexity allows investment banks to get deep into the process of lending and distributing debt. The buyers of the lowest pieces of mezzanine debt are completely different than the buyers of the AAA bonds backed by the senior mortgages (yes, the mortgages are securitized, but mezzanine debt cannot be–for boring details on this to look into REMIC rules and other minutia). The natural buyers of the lowest pieces of mezzanine debt are firms that, in the event of default, can own the property and operate it well. This is an important fact. Some buyers of commercial mortgage debt will refuse to purchase debt on a property, especially large or complex properties, if a smart firm with a good track record of operating properties isn’t in the first in line to take over the property in the event of a default (called the first-loss debt position). Now, let’s explore what actually happened over the past few years. 2006 was the year underwriting standards totally died. Highly levered transactions became the norm, case-in-point is the EOP transaction. This was financed with floating rate debt and was very highly levered–EOP’s portfolio was yielding about 4% to 5% on the purchase price (although, this was on the final purchase price which was settled on in 2007, but the underwriting and debt commitments were all negotiated in 2006). Here’s another dirty secret about Blackstone’s buyout of EOP: the rating agencies, to rate debt, have to do their own underwriting of the properties and come up with their own, conservative, cashflow. Most, if not all, of the underwriting the rating agencies used was directly from Blackstone. This was not uncommon when the rating agencies were involved in a transaction with a large client who had a good brand name. EOP is merely illustrative of a top-of-the-market deal. Although, there are other huge examples. Benchmark underwriting standards went from a 1.20x DSCR to 1.15x or 1.10x, although LTV’s stayed at 80% (although valuations were sky-rocketing). A huge percentage of loans were interest-only, so the balloon payment went from 80% of the loan to 100% of the loan. Think about that… A borrower is constrained by their ability to make payments on the debt, but they are only constrained to 1.10x their debt payments, which don’t include amortization payments, and the constraint is based on your expected future cashflows (which, obviously, assume rent growth! ), not your current cashflows. Starting to get the picture? Properties became over-levered in the instance where any problems developed.Who pushed for this? Developers and property owners. As a matter of fact, the push to grow market share and revenue meant that banks needed to lend more so they could sell more debt and securitize more. 2006, for these reasons was the peak of lending on commercial properties. Between 2005 and 2006, I would estimate, 40-50% of all the currently outstanding commercial mortgage debt was originated (the chart in the WSJ article bears this out). 2007 was the year that problems began to occur. 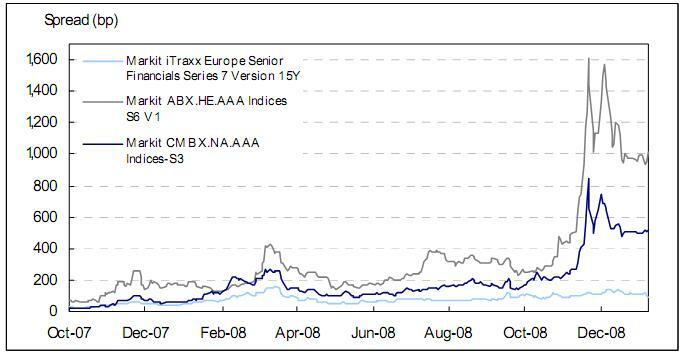 Spreads blew out to record levels (at the time, those records are being smashed all the time). Within six months of relaxed standards being instituted, they were rolled back. It was also during this year that supply of debt, including the unsold inventory referred to as hung debt, far outstripped demand. Because of the large percentage of “fast money,” or hedge funds, in the real estate debt markets (see #7 in that post), when spreads moved against them the largest players took huge losses and shut down (“blew up”). 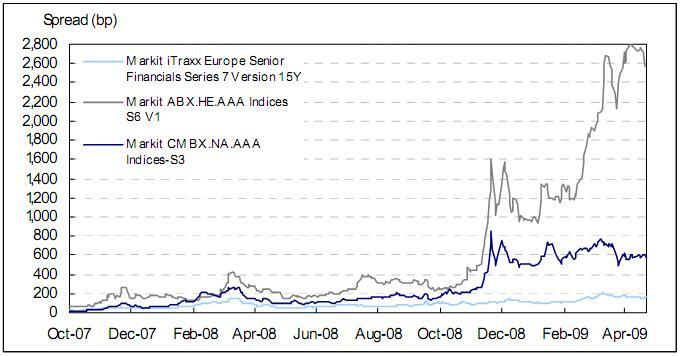 Also, CDO’s were a huge consumer of this sort of debt, and the non-corporate CDO market stopped completely in 2007. Seeing the headwinds for reduced demand? So, in essence, the marginal buyers of debt who could live with relaxed underwriting standards, because they needed to get enough debt to issue a CDO or invest their new $1,000,000,000 they raised, disappeared. 2008 was, in essence, more of the same. The same pressures and lack of demand persisted and debt prices continued to sink. Also, more buyers of debt left the market or shutdown, compounding the problems. So, now, we can examine the request for bailout funds by developers. In the next three years, there is, according to the article, citing some firm I never heard of, $530 billion coming due ($160 billion in the next year). Well, I can count, so let’s count backwards. The vast, vast majority of mortgages are 10 year mortgages with a balloon payment, so those loans made in 1998 with this structure will be coming due. Rents are up significantly since then (page 23), perhaps 40%. Cap rates have also compressed significantly. Taken together, these two facts mean that someone with a stable property, who got a mortgage in 1998, is coming due this year and has 40% more cash coming in from the property and can lever that cashflow much more now. I think those people will be fine refinancing. Ditto for all normal loans coming due in the two years after that. What’s left? Well, all the risky, shorter term loans. These are 2 year loans that can be extended by one year up to a total term of five years, traditionally. In my estimation 95% of the floating rate loans I’ve seen conform to this structure. Well, two years ago means originated in late 2006 or early 2007. Three years ago is 2006 or 2005 (very top of the market). You see the pattern. These loans are the riskiest projects, undertaken at the top of the market. These loans were made with aggressive assumptions underlying their underwritten cashflows, top-tick valuations, and higher levels of allowable leverage than at any other time in recent memory (certainly in the time this market has been considered mature). Seems like I just made the case for the developers, no? Absolutely not. Common sense tells us that these risky loans aren’t the normal apartment buildings, malls, retail space, and industrial space–those are the 10-year loans we talked about. These risky loans are for acquisition and re-positioning of hotels, construction projects resulting in marginal increases in commercial space, and highly levered purchases of portfolios of properties. Not exactly the sort of properties that are the backbone of our economy. Even worse for developers is the fact we discussed above: short term loans are designed to transfer owners. Defaulting on a highly levered property usually means the property owner becomes someone as good, if not better, at running that same property type. No one will come to their office to see the front door padlocked and the bank selling the building for the majority of these loans. Oh, and the majority of those 40-50% of loans I estimated were made in 2005 and 2006, based on frothy valuations and underwriting, will be coming due in 2015 and 2016–those numbers, then, can’t be in the numbers presented by developers. The conclusion? Devleopers are using big numbers to scare people into putting money up to backstop the riskiest of their highly-levered projects. As a matter of fact, there was quote in the WSJ article. “The credit crisis has got so bad that refinancing of even good loans may be drying up,” says Richard Parkus, head of commercial-mortgage-backed securities research at Deutsche Bank. There’s widespread agreement that a record volume of commercial real-estate loans made during the boom years are starting to come due. According to Foresight Analytics, the $530 billion of commercial mortgages that will be maturing between now and 2011 includes loans held by banks, thrifts and insurance companies as well as loans packaged and sold as commercial-mortgage-backed securities — or CMBS. Unlike home loans, which borrowers repay after a set period of time, commercial mortgages usually are underwritten for five, seven or 10 years with big payments due at the end. At that point, they typically need to be refinanced. At the heart of the financing scarcity is the virtual shutdown of the market for CMBS, where Wall Street firms sliced and diced commercial mortgages into bonds. During the recent real-estate boom that took off in 2005 and lasted through early 2007, that market fueled the lending to real estate because banks could sell easily the loans they made. Wow! Five, seven, and ten year loans, made between 2005 and early 2007 are coming due between now and 2011! The disproving of these are left as a simple exercise for the reader. What’s not clear is how soon the crunch will come. The Real Estate Roundtable, a major industry trade group, predicts that more than $400 billion of commercial mortgages will come due through the end of 2009. Foresight Analytics estimates that $160 billion of commercial mortgages will mature next year. Jeff DeBoer, president and chief executive officer of the Roundtable, says the group came up with its estimate by looking at the $3.4 trillion of commercial real-estate loans outstanding. It’s not unusual for roughly 10% of the industry’s debt to roll over every year, he says, referring to refinancings. This year, some $141 billion worth of commercial real-estate debt owed by property owners and developers to lenders came due, according to Foresight Analytics. Most of that was refinanced or extended by existing lenders. The lion’s share of those loans was made between five and 10 years ago. Despite the recent decline in property values, the underlying buildings were still worth well more than their mortgages and were generating sufficient cash to pay debt service. Well, I guess not. So, the larger number is a guess based on the “take a large number and multiply it by 10%” rule. The smaller number is similar to what was experienced in 2008, where most of the debt was refinanced or extended by lenders. Further, those properties that make up the “lion’s share” were worth much more than their mortgages and generating sufficient cash to pay their debt service. Oh, and they were originated between 5 and 10 years ago, as I conjectured above. Seems like there is no justification, whatsoever, for spending a dollar on “bailing out” commercial mortgage developers. (I really want to put a Q.E.D. here…). I was reading Felix’s post, recently (I know, I’m behind on everything… I’m posting on that soon too), where he cites a Tanta piece on negative amortizing loans. And it prompted me to have a very specific memory. … that your post on option ARMS got me thinking about. No one, and I literally mean NO ONE, who works in securitized products knows very basic things about the loans, as you touched on. But the people securitizing the loans and selling the bonds don’t know very basic things that fall under the “you should be shot for not knowing something this basic” category… Here’s what I asked a whole bunch of these master’s of the universe and none of them knew the answer, they all guessed. 1. If you curtail the loan then your interest payment reduces. However, this means your payments are no longer “level” … They change from month to month. This is because amortization schedules set based on simple interest computation (rate*loan balance) but the principal is set to keep the payments level. When you curtail the loan, you destroy this balance. 2. If your interest payment reduces once, but the overall payment doesn’t change, then you have a loan that starts to amortize much faster than before. Why? Well, the bank can’t charge you interest for that month on a principal balance that is lower, right? So if your payment is “x” and you paid off 5% of your loan, because the interest portion of your payment is 5% lower, if the payment hasn’t changed that money that would have gone to interest on the paid off amount goes to principal repayment. This compounds the same problem for next month’s payment. 3. No one was aware of loans being recast. It doesn’t seem to be the case that loans are recast once someone sends in more than their payment, and it also doesn’t seem to be the case that loans are recast on any sort of schedule (annually, for example). Not a single person thought this happened. Most common answer was “principal balance goes down” …. And once the details were asked? One usually got a hand wave and an answer of “Curtailments are so rare, this is unimportant.” Even the people modeling the actual cashflows didn’t understand what happens to loans when curtailments come in. They would model it as a partial prepayment of the pool, but not alter anything else (after all, curtailments are rare! why bother modeling them correctly?). Ha! I did call some mortgage companies and it seems they do “turbo” the loan, essentially, by keeping payments level and applying more to principal … But this, obviously, makes it les than a 30-year loan. However, some mortgage companies will allow you to recast the mortgage totally for payments that are large enough. This comes from a comment I left on Barry Ritholtz’s “Bailout Plan Open Thread” the other evening. The basic premise is that the “Bailout Bill” as we know it basically says we need to go out and “lift” the street out of toxic crap. Then, the world will be better. It’s at least a bit less like the Underpants Gnomes in the sense that the toxic crap and the freezing up of the credit markets are linked… However, here’s the plan we should see if we, as taxpayers, really want our money going to help us. 2. Recast all delinquent loans to be much longer, have lower interest rates, and be much harder to abuse. Guess what interest rate you get on a forty year mortgage? A lower one! Why? Because the duration is much higher. Why? If I make five basis points per year over the life of a forty year loan I’m making more money than if I earn five basis points over the life of a thirty year loan. Thus, the interest rate where I make the same amount of money should be lower on the forty year loan. The government doesn’t even need to smash any potential profits to make loans more affordable. 3. Offer financial institutions two options: sell the government’s bailout fund loans or securities at the price the government offers to purchase them at, or sell them at their mark and give the government equity. Why? Because if the bank isn’t willing to sell at a reasonable bid, furnished by the government, then their mark is over-inflated and they are trying to avoid an adverse hit to earnings–the government should receive more compensation for bailing out the bank. This should be applied to each position one at a time–no securities should be purchased in aggregate, that’s too easy to game. As a matter of fact, that’s how sub-prime worked to begin with: pools of loans got more and more barbelled and the bottom loans defaulted. On average they were normal, in reality they were crappy enough to break the securities. Oh, and the equity should have voting rights. Of course, there are questions to be answered. 4. Lend directly to people and small businesses. If the economic fears are all about the seizing up of the credit markets, we should be able to fix these problems by lending to those that live and die by financing. Create very strict standards for qualifying for these loans. FICO and income requirements, unlike sub-prime loans had. For businesses, underwrite loans to actual income and asset levels and only lend very conservative amounts of leverage. 5. Immediately raise capital requirements across the board. As Steve Davidoff notes (Lesson #4 when one follows that link), when you need to raise capital the most, you can’t. He concludes, as I have before, that this is a wonderful argument for raising capital requirements. Also, less levered institutions are more sound in general–there is more room for error. And, as one could guess, the competitive “flavor of the day” businesses, like C.D.O.’s and sub-prime, are much more levered because financing these products is viewed as a way to win business. This is why the institutions with cheap balance sheet are experiencing huge writedowns due to counterparty exposure with financing arrangements. Citi disclosed writedowns of billions in warehouse lines where C.D.O. issuers were holding bonds with nearly no equity, on Citi’s balance sheet. 6. Required compensation reform. It’s well documented, conjectured, and even assumed that Wall St.’s compensation scheme is to blame for a lot of the mess we’re in. Swing for the fences and jump ship to another bank if it doesn’t work. That’s what it seems the most recent round of large bonuses for executives and traders that caused this problem were following. It’s simple, if you need money from the American people, you sign on to these reforms. Otherwise one might encounter a moral hazard due to government subsidized capital. Honestly, it shouldn’t be that hard to come up with an onerous set of restrictions and requirements for paying people exorbitant sums of money. 7. Immediate and broad consumer protections and consumer financial product reform. Rather than have banks start to do whatever they want to reduce their risk (I’ve heard reports of people with home equity lines in good standing paying their bill one day late and having the entire line canceled) require they treat their consumers fairly. Completely restrict the ability for banks to raise rates on things like credit card debt–to retroactively increase rates on existing debt is ridiculous in the first place. In an economy driven by spending and credit, for better or worse, putting consumers further at risk of defaulting on their obligations is stupid. Eliminate binding arbitration of consumer debt–just invalidate it completely, retroactively. I would prefer this practice be eliminated altogether, but if we’re keeping to the topic at hand I’ll only put forth that proposal. Lastly, put strong disclosure requirements in place for all consumer debt products, including new loans or recast loans. Require institutions to show the annualized rate, over the life of the loan, if interest rates rise 2%, 4%, 5%, and if the forwards are realized. Require large print, plain English disclosures. Some people will say Im trying to babysit people, but, honestly, how can one argue against requiring banks tell their customers basic information about their loans? Right, one can’t. This is what we should have gotten to both get the economy and markets moving in the right direction and ensuring the confidence in institutions and consumers are both restored. Just my opinion..
Isn’t this just like politicians… Now that they are bailing out some “too big to fail” firms and starting up a mass-produced bailout, why are they buying securities? Shouldn’t they be bailing out homeowners? They vote. If a bank is carrying loans, or securities, on their books at seventy cents on the dollar then why not give the borrower enough to pay the loan off (assuming it’s mark is it’s current principal value)? Anyway, by forgiving the loan, the potential exists for a C.D.O. to be paid down too–don’t forget they are securitizations of securitizations. Maybe using taxpayer money to have the newly taxpayer-owned G.S.E.’s (more than sponsored, I suppose) make a loan to them at a much lower rate )obviously for the lower amount)? Honestly, seems illogical to go around bailing out financial institutions when those benefits are perceived to be more concentrated … More benficial to people who caused the problems rather than those who stand to lose the most from them.